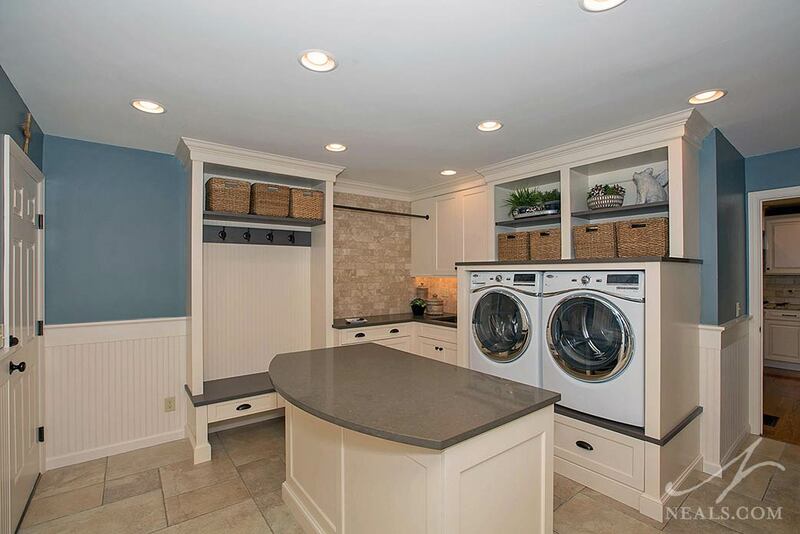 An awkwardly large laundry room in this Symmes Township home was a great opportunity to create a functional space with unique amenities. 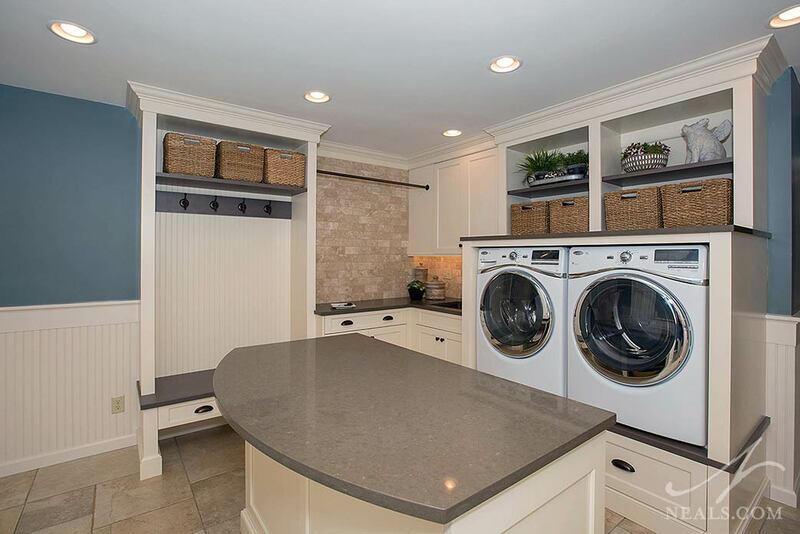 The quirkiness of the laundry room came from the fact that it used to be an office. 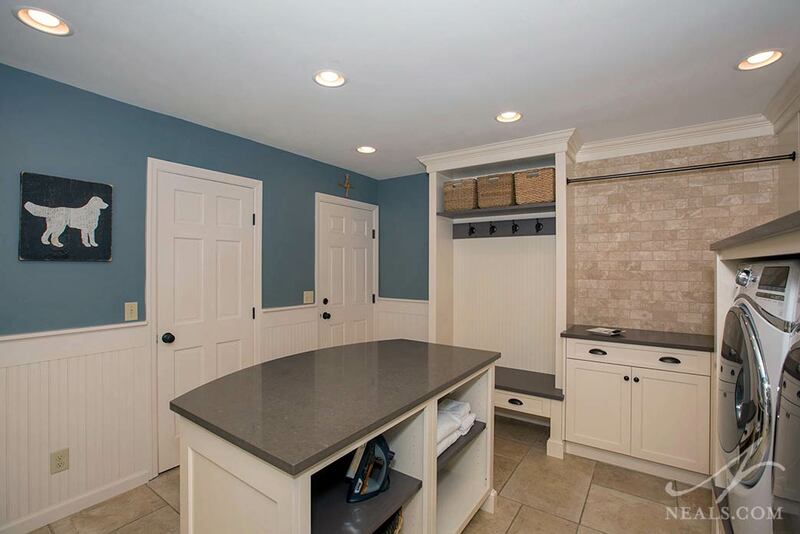 This home was a model home, and when it came time to make it a functional space for a family, the only sensible use for the large extra room was to be a laundry room. 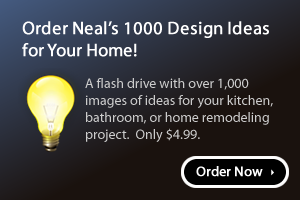 The problem with that, however, is that what makes a good office makes for an over-sized laundry room. The homeowner's had two primary issues with the space. The size was the first, including how empty it was. The second was that the screened-in porch was attached to this room, so the view into the house from the porch included the view of the washer and dryer. The solution for the laundry room had to tackle these two issues. To make the most of the room, designer Cyndi Kohler expanded the room's purpose to also include a mudroom element. This created the need for additional cabinetry to fill up the open walls. 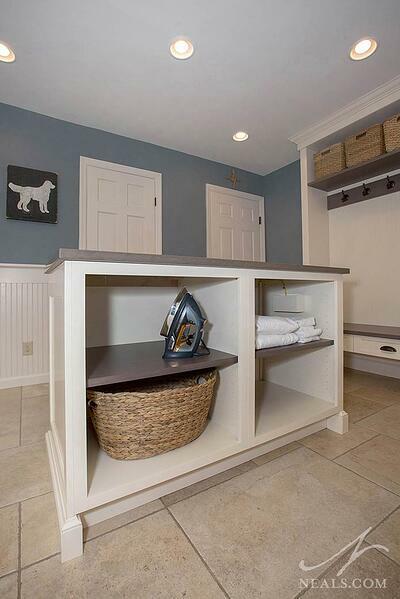 A large bench unit, a classic mudroom design configuration makes good use of the far wall. Cubby storage above maximizes the feature. Making use of the center of the room, an island with open storage below provides a useful counter for sorting, folding, and other tasks. The open shelving in the base is sized for the laundry baskets, which keeps the large room in order and clutter-free, even on laundry days. 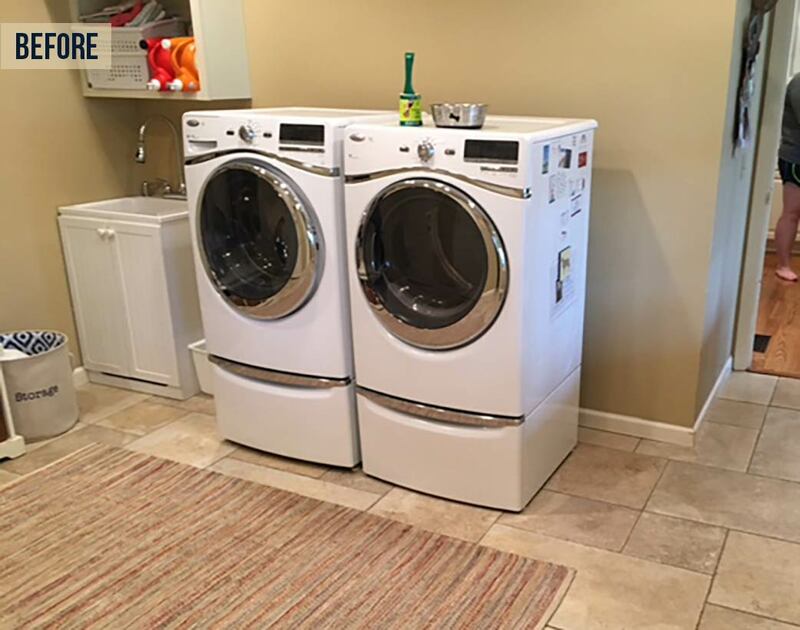 To handle the issue of the machines being unsightly from the exterior porch, Kohler designed cabinetry around the front-loading machines. The machines are raised on top of storage drawers, and a counter above provides additional space when needed. Cubbies above mirror the styling of the bench area. To complete the functional design of the room, an L-shaped counter with cabinets above fill in the corner. A stylish Blanco Silgranit sink in Cafe Brown replaces the utilitarian basin that previously occupied the space. The addition of a rail provides a place for hanging clothes when needed. For contrast and continuity in the space, a two-tone design was used. 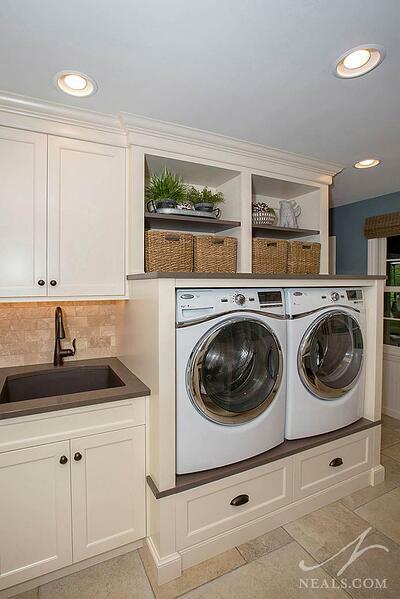 The Brookhaven cabinetry is creamy Antique White, while all the horizontal surfaces, the counter, bench and shelves, as well as accents around the machines, are a warm dark brown. The wood is Brookhaven's matte Storm Cloud. The counters are Caserstone's Lagos Blue. The mixture creates depth to the room and visually fills the space without physically requiring more cabinetry.